I heard that familiar 'biong' on my phone. Uncle D from Silversky messaged me to inform that Wellness Core has new five products. My blonde eyelashes fluttered as I saw that golden word - SENIOR. Finally! Wellness Pet Food has come up with senior formula and boy oh boy was I excited. Okay okay. I am in the over-the-hill 'geriatric' category. At [almost] 12 years old, I have pawed past the 'senior' mark. My dear brother, Frodo Choo, is still in the safe zone of senior. Can you believe that even Frodo is a senior already? But his brains still remain at.... junior. Post THAT fishy case of Wellness Pet Food, Frodo and I were maintaining on Wellness Complete Health Grain Free Deboned Chicken and Chicken Meal. As I am writing this post, I am happy to announce that this is my 10th year anniversary on Wellness Pet Food! I messaged Uncle D and asked him if we could try the brand spanking new Wellness Core Senior Dog formula. I was excited to see what is this new Senior formula all about and if there are any obvious difference to the regular adult/maintenance diets and truth be told, I did not even bother to go read up on it - yet. In due time I will... like now. And I got a YES! On this note, I must once again give ample thanks to Silversky for supporting us in our sporadic changes of Wellness formulas even my ghostwriter has been so preoccupied with her problematic knee rehabilitation that I had [sort of] MIA-ed (missing in action) for just about 4-5 months. My ghostwriter does all the hard work of putting together my articles while Frodo and I... simply enjoy and devour our new senior food. After receiving my first bag on Wellness Core Senior formula, I excitedly whipped out my glasses to see what is so special about the senior diet and if there are any significant differences between the 'regular' diet and 'senior diet'. 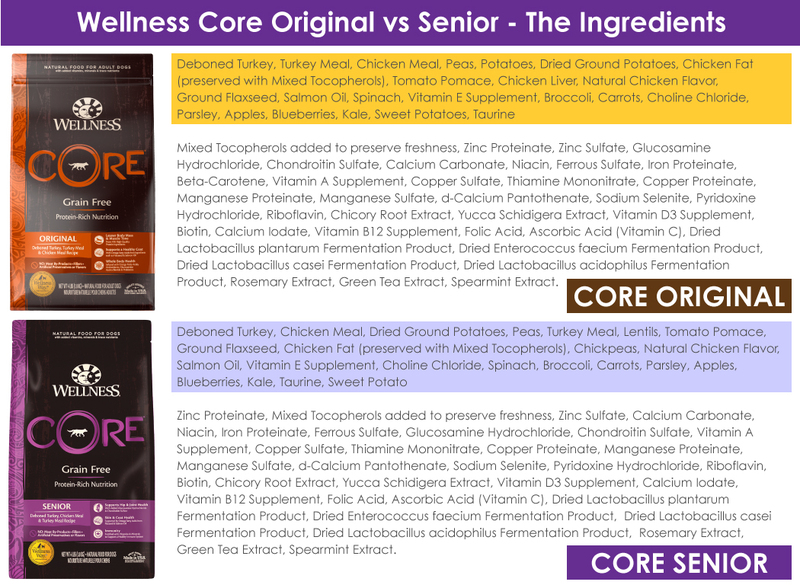 After having a quick look at the ingredients on the Senior bag, I realized there was no significant difference between Core Original and Core Senior. The main protein for both is Turkey and i-sob! The senior diet is missing one of my favourite ingredients of all time - chicken liver. But the senior diet contains lentils and chickpeas which are known to have health benefits. Highlighting the key 'goodie' ingredients before looking at the other what-I-call blahs - the added supplements. Clearly there are no significant ingredient differences between the regular and senior diet. And both contain turkey as the core protein. No increase of fibre intake required though cellulose fibre is recommended. The differences between both diets are marginal but yes, the senior food is lower in fat, higher in fibre (as commonly found in senior diets), lower in protein, and calorie content (15% lower) too. A slight variant from the recommendation but nothing alarmingly off the charts or different from its regular diet either. 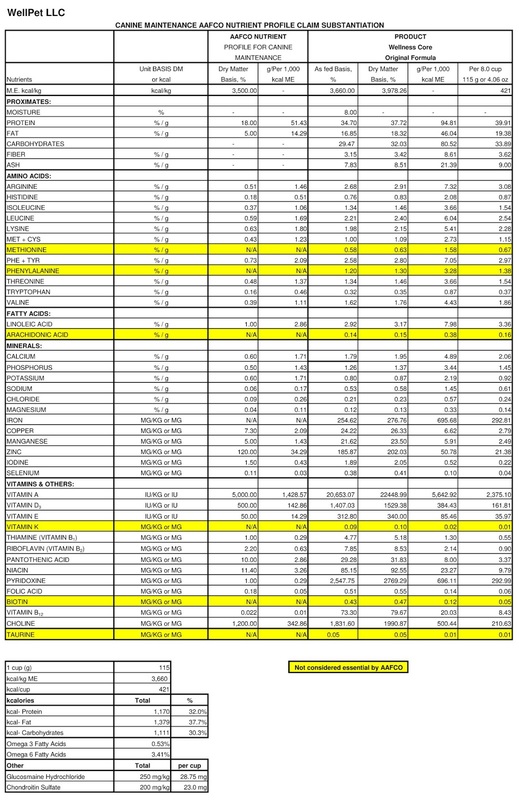 Dog food advisor has done a good summary of what the AAFCO Dog Nutrient Profile is about (with no numbers provided) so I encourage you to read it. But of course, silly me! I should have read the AAFCO statement on the bag from the beginning of time! But I ain't gonna kill my old man eye sight squinting to read the small print so I went to Wellness Pet Food website to verify what the senior formula statement reads. After all this time of researching only to realize that it is a MAINTENANCE profile. Not some magical senior profile. I felt like an absolute idiot! 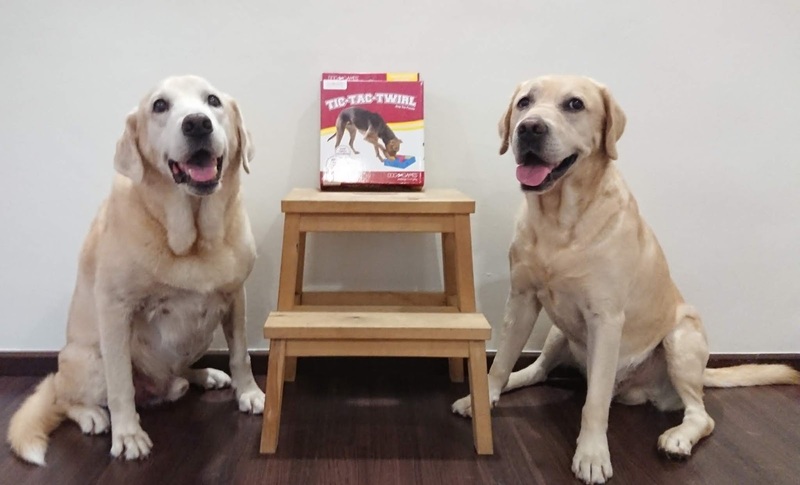 And as of now (11th August 2018), dog food advisor has yet to review the senior formula. But based on how similar it is to the Core Original, I would reckon the rating should be... similar. That's just my guess. 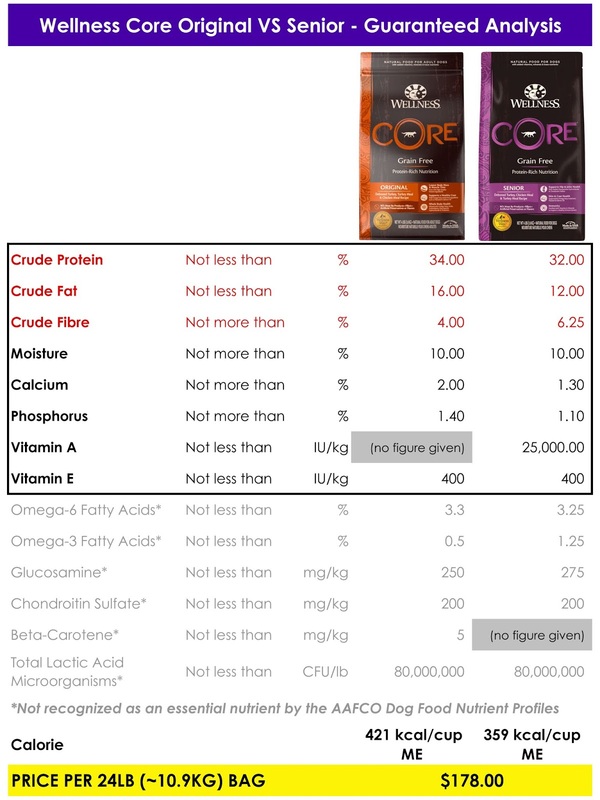 And talking about numbers, Wellness has included a downloadable comprehensive nutrient profile of the Core Original on its website. That is actually really cool. After all this time of trying to find the AAFCO nutrient profile and lo and behold! Wellness shares it openly so we, the consumers, know exactly how Wellness food measures up against AAFCO standard. It just boosted my confidence in Wellness Pet Food yet again. Data sheet downloaded from the Wellness website to see how Core Original measures up against AAFCO nutrient profile requirements. Very important information for consumers and I hope they release the data sheet for its senior formula soon! One very important thing I do have to highlight about the packaging of the senior formula.... I have no idea WHY but it is possibly the only Wellness formula that DOES NOT come with the self-sealing (ziplock) function! Why oh why Wellness Pet Food? Amazing how a thing like self-sealing function can get marks taken off its otherwise reputable product. 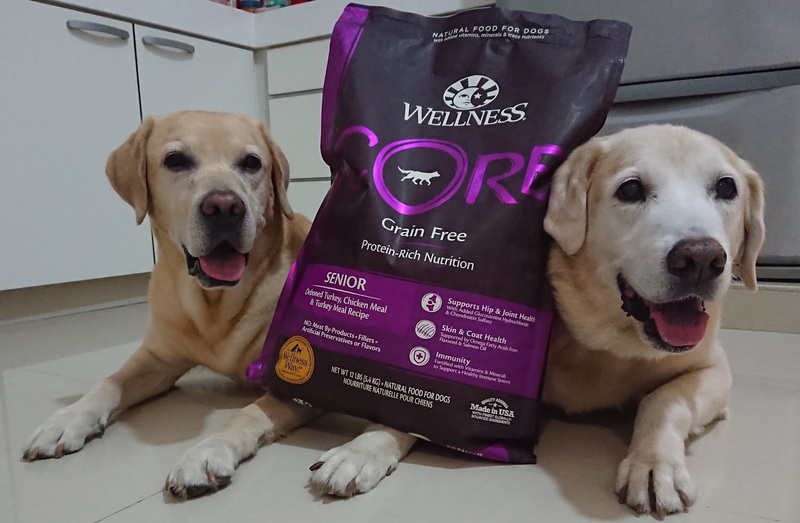 Conclusively, Wellness Core Grain Free Senior Formula is similar to its flagship Wellness Core Grain Free Original tweaked with lower caloric and fat content for senior dogs. I do miss my chicken liver though! I wish Wellness Pet Food had retained that oh-so-yummy chicken liver with added lentils and chickpeas! *guffaw* I am a greedy 12 year old who loves his food. So... the question is... with marginal difference in both food and senior formula without self-sealing bags, would I still choose to continue on this food? It is a marginal yes between chicken liver and no chicken liver. I am only kidding. 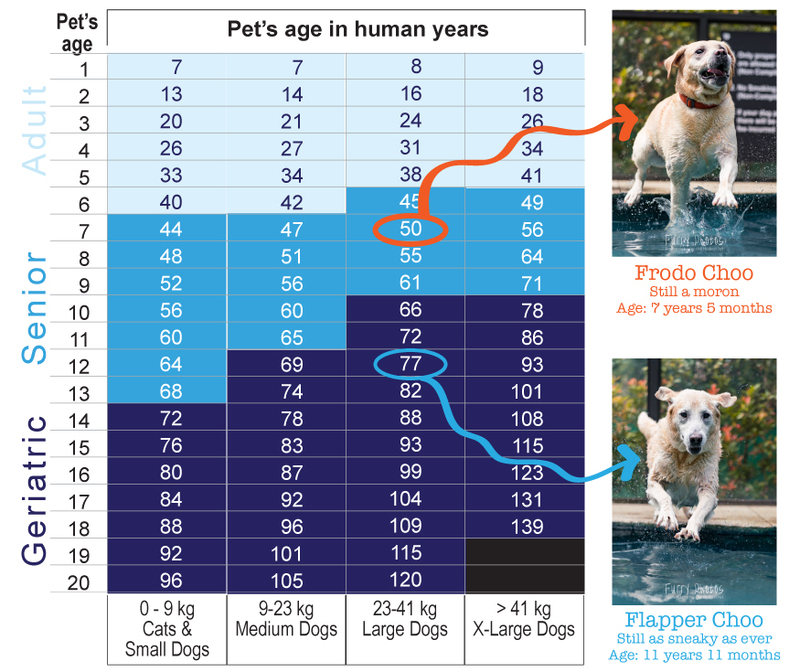 Primarily the minor tweaks are important for a senior dog. And like the Core Original, Frodo and I do love the food very much. Mummy has been complaining that our mealtime drooling has gotten worse. Surely the state of our classical conditioning with Wellness food tells a story?